Throw 'n' Crush is a minigame from DK: Jungle Climber. 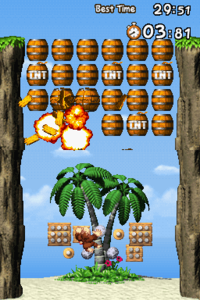 Accessible from the Challenge menu, the player must use Donkey Kong to throw rocks to smash barrels and destroy boulders to earn points within a certain time limit. This game resembles Barrel Blast from Mario Superstar Baseball. This page was last edited on May 7, 2018, at 20:26.